Photo gallery at bottom! So most people are probably aware that The human DNA in every one of us traces back to Africa. However, for most of us it’s been a long time since we’ve had a relative in Africa – and even at that Africa is a pretty big place. Monarch butterflies on the other hand ALL come from one place – and every single monarch is at maximum 2 generations away from actually being back in that place. This is what it looks like there when they all get together – all 15 million of them. Everything that looks like it’s orange is a butterfly – Every part of those clusters of ‘stuff’ on the trees — they are butterflies! 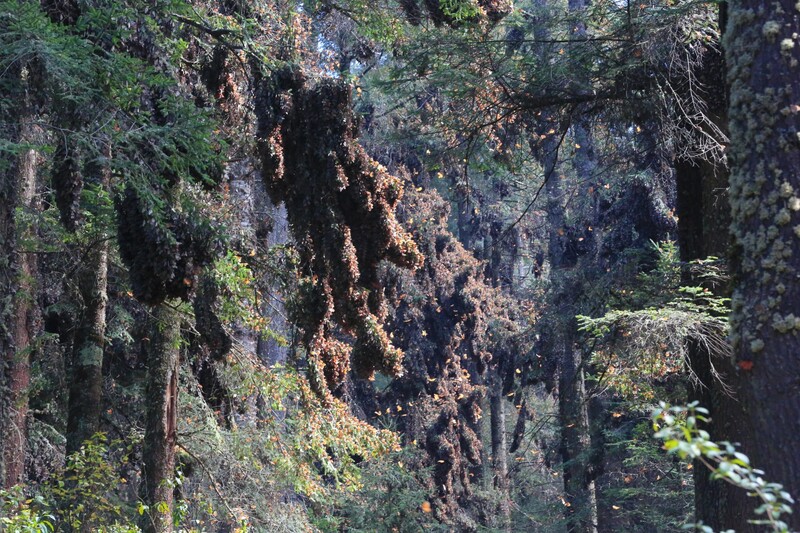 That place is a tiny slice of Mexico’s Michoacan state in pine forests at 10,000 feet of altitude and every winter millions – literally millions of Monarch butterflies return to rest and restart the cycle. I woke up at 5AM in Mexico City to get on a 3 hour bus ride into mountains that look very much like the Sierra Nevadas in California. The bus dropped me off at the Unesco heritage town of Anganguea where they know that every gringo getting off the bus is coming to see the “Mariposas” (butterflies) and is ready to offer you a cab to the trailhead of the preserve. One thing to note that so far everywhere we have gone in Mexico so far although they are always trying to sell you something it’s much more subdued than my memories of other places. It doesn’t feel oppressive that people are yelling at you to come with them. There was a more or less orderly line of taxis and I got the first one. My driver was talkative and very friendly – he had me sit in the front seat. We chatted in broken Spanglish for the windy 30 minute drive. He waved at just about every person walking up the steep hill. At the entrance to the Rosario butterfly preserve they asked me if I want a horse ride up the 2 kilometer journey. I had heard it was a steep hike and we were at 10,000 feet at this point so I went for it for 80 pesos (about $6). 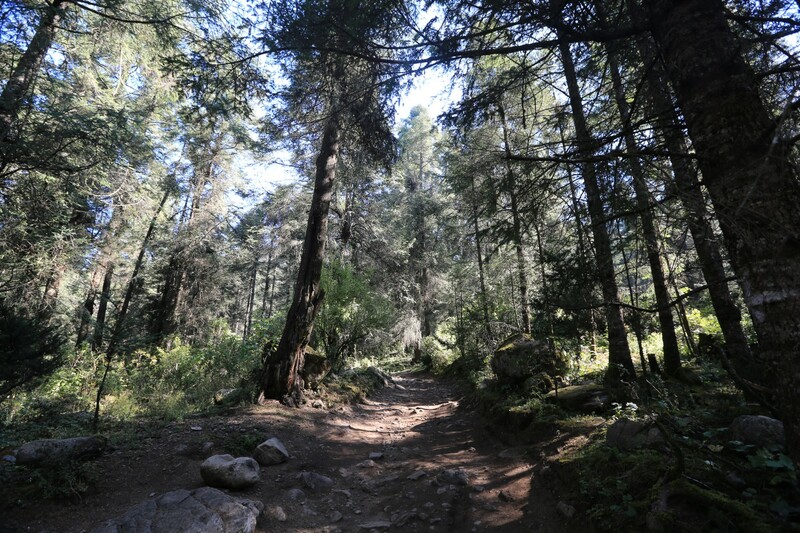 My horse was lead by a walking guide through a gorgeous pine forest with the clearest of fresh air. My constant walking and biking of late appear to have made me resistant to altitude issues – it felt great. But onto the point of this all – the butterflies. It’s really almost impossible to explain. Words don’t do it justice. After a short hike with another guide we reached the area where they have roped off at viewing distance the strand of pine trees where scientists estimate that around 15 million butterflies live on about 1000 trees. I was there on a perfect day – apparently the activity has a lot to do with a cold night being warmed up by clear warm sun. That’s what we had and the activity was drop dead beautiful. Everywhere you looked there were butterflies flying around – literally everywhere. Video can’t capture it, photos certainly can’t capture it. Sure, they make an effort too but it’s sort of like Burning Man – it just doesn’t really tell the whole picture unless you were there….. Which is funny because in writing this it makes me realize what the authors of the Lonely Planet wrote about the butterfly preserve – they said “It’s like a giant Burning Man for butterflies” – when we read it we didn’t exactly understand the reference – and – maybe mine isn’t what they were talking about but it does make sense to me! Katie made the decision not to go because we saw a documentary where they had really extreme closeups of branches covered with a wallpaper of moving butterflies. It’s too bad we saw that movie because in reality you never get that close to the big clusters that were shown in the movie. The local caretakers are very cautious about their natural treasure and only allow you to watch from a safe distance where it’s just a world of beauty in organge wings. I stayed for about 2 hours just enjoying the mountain air and the peace and the glory of the movement in orange and black. I chose to walk back down the trail. It was a lovely day and the contemplative forest was a great place. Final note – it’s really amazing how the people of Mexico have come to understand these amazing natural places that they have within their country – from the waterfalls, to the nature preserves, to places like this – they really work to preserve them. It’s one of those odd things about Mexico – so much trash in some places but so much care in others. The villagers in this town actually own the land and treat it with the ultimate of respect – it’s not a government park and I feel like in the United States that it would be treated much less with kid gloves. Anyhow – hope the pics and the stories make you smile. If you go to Mexico city it is unquestionably a worthwhile day trip. I made it back to the City by 7PM. The bus is comfortable and uncrowded with gorgeous scenery along the way. The whole trip (not including food – which I would be spending money on anywhere) cost me $240 pesos round trip bus, $300 pesos for the cab, $80 pesos for the horse and $80 pesos for the park – $700 pesos or roughly $50 US to see something I will never see the likes of again. I’ll call that value! What a beautiful, poetic experience Mark! Thanks for reading Sloane 🙂 Hope you’re having a great start to the year!